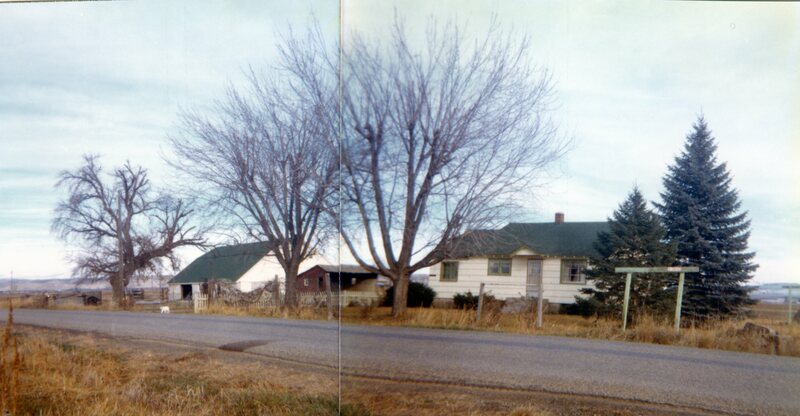 Chandler home, 5400 Butte Rd from 1933 to 1994. Paul and Zola Chandler bought 32 acres for $1500 in 1933, then added another adjacent 20 acres for $2,000 in 1942. This was mortgaged and repaid over ten years at $162/yr, and similar for the second one. That seems such a small amount today, but my parents barely were able to come up with that money by picking apples. They lived in fear of losing everything as so many around were doing. An insurance company in Portland was the seller. They had foreclosed the property some years before. It had been in prunes—however, when the previous owners lost the property they abandoned it as was so common back then. Without anyone to care for them all the trees died. The insurance company, unable to sell it with dead trees, hired large steam driven equipment to push out the trees into a pile and burn them. Then to rough level the torn up ground. The insurance company owner hired a man by the name of Moss to sit on the property to prevent squatters. Moss stripped the property of anything of value, such as fences, and even dragged away the small shack. When the Chandlers arrived to take possession they found only a small root cellar remaining. I was six months old then, and we lived in that cellar until I was five. Electricity was finally brought in 1938. It cost $2500 ($500/pole) to bring it down Butte from NW1st. Today it seems so strange for the electricity to cost more than the property. It was an extraordinary burden. Our neighbor, Platz, moved his house to NW1st from south of Noble Ditch rather than pay to have the power extended. We couldn’t do that because we didn’t own any land on the roads that had the power lines. In 1938 Paul bought a 10’ x 14’ used surplus garage from the construction of the Owyhee Dam, and moved it onto the property. 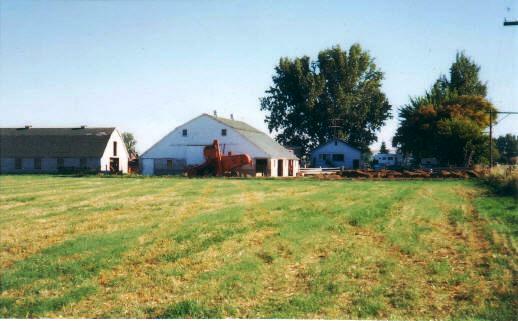 That would be home to us four kids until we built the pictured house and barn in 1944. Irrigation was impossible until the rough level job was done much better. This was very difficult with just horses. When Paul bought the property it would take two years work before any crops were able to be planted because of the rough condition of the land. For those two years we herded our sheep along the road bar pits. This land, like all local land, had swales and ridges making row irrigation very difficult. For some twenty years Paul leveled some every year until he had perfectly leveled that land. We filled in a drain ditch, moved laterals, and under-grounded some ditches until the first 32 acres became a single large perfectly leveled field—a dream come true. At first it was a mishmash of small fields being irrigated in many different directions.